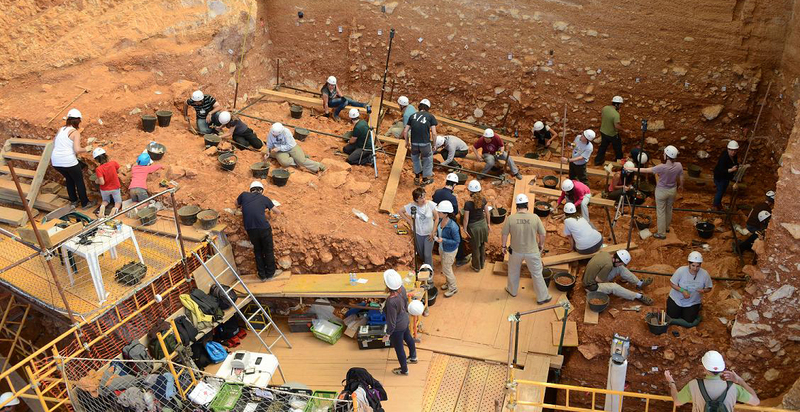 Summary: The research group is aimed at studying human evolution in its biological, cultural and social aspects during the Pleistocene, from specific areas such as paleoanthropology, lithic technology, zooarcheology and tafonomy and human cognition. The scientific strategy is based on a strong investment in fieldwork, in the systematic preparation and analysis of archaeological materials to obtain original and reliable empirical data, and actualism and experimentation as methods for setting and contrasting explanatory hypotheses. All this allow a critical discussion and innovative contributions to the interpretative approaches. A major interest is posed on the paleoecological relationships between biological and cultural evolution, especially in the context of the early stages of the human settlement of Europe. The approach is interdisciplinary in nature, from the fieldwork to the publication of results, and combines research, teaching and knowledge socialization. Continuing the analysis of the litho-technical assemblages from the Pleistocene sites excavated in the framework of the research group, as well as from those available as a result of the group's international scientific network. Making progress in the application of the microwear and residues studies to Pleistocene archaeological stone tools, taking advantage of the methodological improvement and the experimental results obtained since 2014. Contributing to the interpretation of the stone tool assemblages basing on the spatial and technological dimensions of the lithic refitting. Integrating data to improve the knowledge of the micro-space management in archaeological sites. Setting of occupational models (objective shared with the line of zooarchaeology and taphonomy). Redefining key issues of the European Pleistocene technocomplexes, from the first Mode 1 evidences until the appearance of the early Middle Palaeolithic. Introduction of the formal modelling in the study of the diffusion of technology. First application to the appearance and diffusion of the Acheulean technology in Western Europe. Study of the transition from Middle to Upper Palaeolithic assemblages in the Iranian Zagros region, to get insight into the tempo and mode of the first expansions of modern human populations towards Western Europe. Studying subsistence strategies, animal resources supply models and strategies, tactics and techniques of hunting with a social and evolutionary perspective. Analysing territorial coexistence (regional and intrasite) of hominins and carnivores in the Lower and Middle European Pleistocene, in order to establish levels of competition or symbiosis between both paleoguilds. Investigating the formation and fossilisation processes of the deposits studied. Extension of the experimental works in order to establish relationships between the originating and/or modifying processes of the archaeological assemblages and their taphonomic modifications according to an uniformitarianist perspective. 3.1. Etoprimatology: research line focused in the study of the hand laterality, learning and social learning, cultural diffusion and technological behaviour of wild and captive chimpanzees, through observational, non-invasive methodologies as a basal model to human evolutionary studies. individuals, such as novice and expert knappers, and schools and traditions. Analysis of the evolutionary process of neandertalisation, using different hominin specimens from sites included in the research project (Sierra de Atapuerca, Tossal de la Font, Cova Foradà, etc.). Conducting morphological and paleobiological studies from anthropological remains (cranial, dental and postcranial remains) focusing on aspects about diet, dental wear and buco-dental pathologies, vascular system and endocranial thermoregulation, sexual dimorphism, hearing capabilities, hand evolution. Applying microscopic and three-dimensional methods (SEM, Confocal, CT, surface scanner, photogrammetry) for the analysis, documentation and reproduction of human fossils. Carrying out preliminary essays on chemical cleaning procedures to remove calcite concretions from stone tools and faunal and human fossil remains: assessing acids and seeking alternative chemicals. Developing support and storage systems for faunal remains: review of traditional systems and proposal for micro and macro faunal remains. Widening research on consolidant products: adding the strengthening parameter to formerly studied reversibility and durability.